After making an interesting discovery in Earth’s stratosphere, one astrobiologist is suggesting that aliens are trying to make contact with other planets. Dr. Milton Wainwright, a scientist from the University of Sheffield and Buckingham, says his team has collected a metal orb from the stratosphere oozing with what could be microorganisms. He hypothesizes that extraterrestrial beings could have sent the metal orb to Earth to seed life on our planet. stratosphere. The peculiar orb wasn’t very big at all. When measured, the sphere was the width of a human hair. Dr. Wainwright thinks that this strange metal object could be an example of directed panspermia, a seed sent to Earth from another civilization to send life elsewhere in the universe. He has no evidence to prove this hypothesis. What makes him curious is how fast the sphere hit the sampler on the balloon. The orb made a tiny “impact crater” on the sampler. The sample usually just collects dust and other particles floating throughout the atmosphere. Never has anything made such a high-speed impact. The impact could signify that the orb came from outer space, traveling at profound speeds. Dr. Wainwright and his team sent the balloon 16 miles up into the atmosphere, collecting particulate matter. “The sphere made an impact crater on the sampling stub. This proves beyond doubt that the particle was travelling at speed from space when it was sampled,” he said. After noticing the strange force of impact, Wainwright and his team examined the sphere. It had an outer metallic shell made from titanium and traces of vanadium. Its inner core contained biological material, which could be seen microscopically, oozing out the side. A thin, “fungus-like knitted mat-like covering” encased the metal, oozing orb. Their findings were published in the Journal of Cosmology, but their conclusions of extraterrestrial life sending the orb as a seed are improvable. 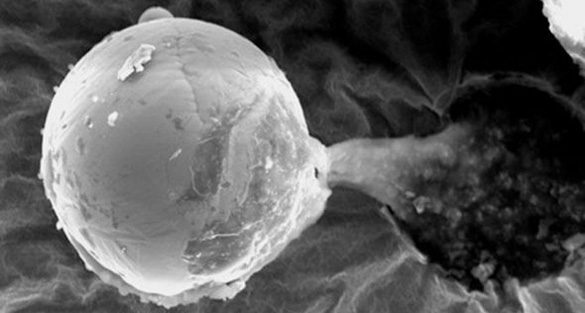 Is this peculiar biological life coming from outer space or from Earth’s surface? However, this tiny biological metallic orb corresponds with other research Professor Wainwright had conducted. At one point, he and his team found fragments of a single-celled alga called diatoms in balloon samples taken from the stratosphere. NASA has even confirmed the discovery of bacteria living up to five miles above Earth’s surface, but does this mean its been sent here from outer space? Is there an unstudied realm of life floating in the stratosphere? Could these microbes be a missing link in understanding Earth’s relationship with the cosmos? Could this orb really be a fragment of life from outer space? Most scientists think that bacteria in the stratosphere made its way up from Earth’s surface instead of coming from outer space. It’s well documented that air currents can carry dust particles and bacteria miles up into the sky. “Perhaps there are luminous or ‘invisible’ jelly-fish like creatures that inhabit our skies, or microorganisms flooding our planet, I’m not convinced, but they are fascinating ideas that make a change from stories of starships loaded with aliens,” Watson said. READ Google is Quietly Recording EVERYTHING You Say — Here’s How To Hear It, Delete It, And Stop It!